Police responded to the Wheeling Federal Building in Wheeling, West Virginia after a man fired about 20 shots at the building on Oct. 9. The shooter reportedly stepped out of his vehicle and fired about 20 shots with an assault rifle, injuring a security guard inside the building, before police shot him, reported the Wheeling News-Register. The police officer who fatally shot the gunman will be on administrative leave pending an investigation, reported Howard Monroe, a local radio show host. A court security officer also shot the gunman. Three court security officers suffered minor injuries and were taken to a hospital, but have since been released, said Gary Gaskins, US Marshal, in a press conference. A witness, Carla Daniels, told the Metro News that she was working nearby and saw the gunman. “I saw a guy with a rifle and he was just pointing in toward the federal building and just shooting. After he fired so many shots, he reached down on the ground and he must have reloaded and he went back to shooting again,” Daniels said. The gunman, died at a local hospital, police said. At a news conference late Wednesday, Wheeling Police Chief Shawn Schwertfeger said the gunman, retired police officer Thomas Piccard, was armed with an assault weapon and a handgun. An employee inside the building told Philip Stahl of WTOV that his window was shot at and he ducked, getting sprayed with glass. 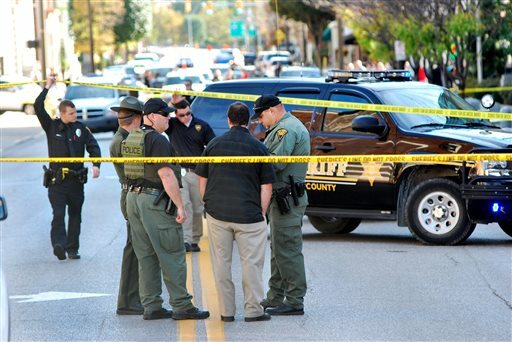 The three-story gray federal building remained cordoned off Wednesday night, surrounded by a heavy police presence in the city along the Ohio River in West Virginia’s northern panhandle about 60 miles southwest of Pittsburgh. David Wohlfeil, the owner of the Metropolitan City Grill near the courthouse, said he ran outside after he heard the first round of shots. He heard two more volleys of gunfire then ran back inside. “I told everyone to get in the basement and then called 911,” he said, adding that police arrived while he was on the phone. Wheeling has been hit by layoffs in the steel industry and its population dropped by 9.3 percent from 2000 to 2010 to about 28,500 people. “Things like this aren’t just happening in large cities, in this country we need to do a better job on mental health,” he said. Story developing; check back for updates.